A blog post by associate director Anita Kassof. 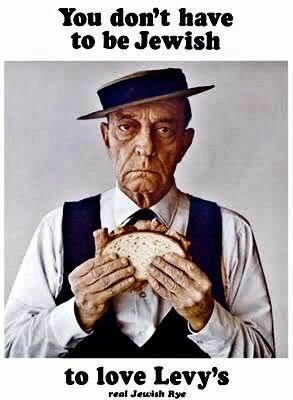 How many of us remember that famous advertising slogan for Levy’s rye bread? The fact of the matter is, Levy’s had it right with that 1960s ad campaign; Jewish and kosher-style food have wide appeal. Think matzoh ball soup, bagels and lox, corned beef on rye, and no matter what your background, your mouth starts watering. Statistics bear out the claim. 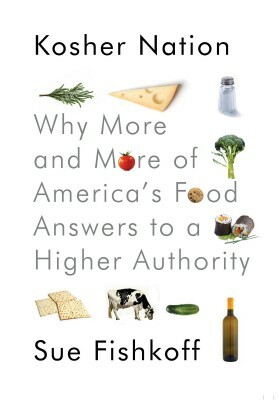 According to Sue Fishkoff, author of Kosher Nation: Why More and More of America’s Food Answers to a Higher Authority (2010), the majority of people who buy kosher food products aren’t even Jewish. To honor the New Year—and to prove my point that great Jewish recipes are great for everyone—I share below a favorite recipe for “Jewish Apple Cake,” which I make every Rosh Hashanah as a sweet way to welcome the New Year. I urge you to try it out and see what you think. I promise you won’t be disappointed. The recipe is adapted from Covenant’s Still Cookin’ 50th Anniversary Edition (1997), which I received as a thank you gift after I addressed the Covenent Guild many years back. Founded in 1947, the Covenant Guild is a women’s philanthropic group that raises funds for various organizations in theBaltimore area. Whatever your own holiday food traditions and however you observe Rosh Hashanah—even if you don’t observe it at all—may the coming months be filled with sweetness for you and your families. Mix cinnamon and ½ cup sugar. 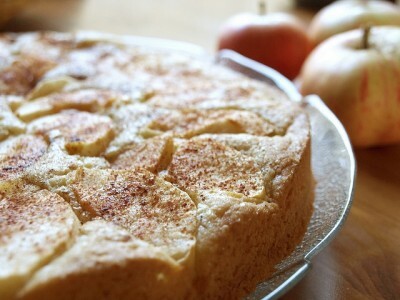 Peel the apples, cut them into thin slices, and toss them with about a tablespoon of the cinnamon sugar mixture. Set aside. Sift the remainder of the sugar, flour, and baking powder together in a large bowl. Add oil and eggs, one at a time, beating on medium speed as you go. Beat in orange juice and vanilla. The batter will be very thick and goopy. Coat a large pan or pans with oil or cooking spray, coat with flour, and shake off excess. I have used two round cake pans, or one 9×13 inch pan. Layer batter and apples, ending with apples, which you should press down into the batter. Use all the syrupy liquid that the apples have released. You can even swirl it on top after you’re done layering things. The cake will be pretty messy and gooey but, trust me, it turns out fine—super moist and not too sweet. Top with cinnamon sugar mixture and chopped nuts. Bake for about 1 hour, testing after first 30 minutes, especially if you are using two smaller pans. The original recipe says you can invert the cake on a platter after it has cooled, but I’ve never been able to do that. Never mind—even served straight out of the pan, it’s delicious!